The rose is an astonishingly sensual flower. Its deep and vivid hue enraptures, the velvety, eerily skin-like feel of its petals titillates. Not only is its aroma a twitterpating syrup of wine and lemon and earth and honey, but depending on the preparation of the rose, you can also eat it, drink it, or schmear it. I'm a long-time devotee of the cult of the rose, and years of pursuing its seductions has resulted in the following bouquet of delights, picked just for you. Baume de Rose sinks into flakey, abandoned lips and transforms them into pillowed lusciousness. That's the “Baume” part. 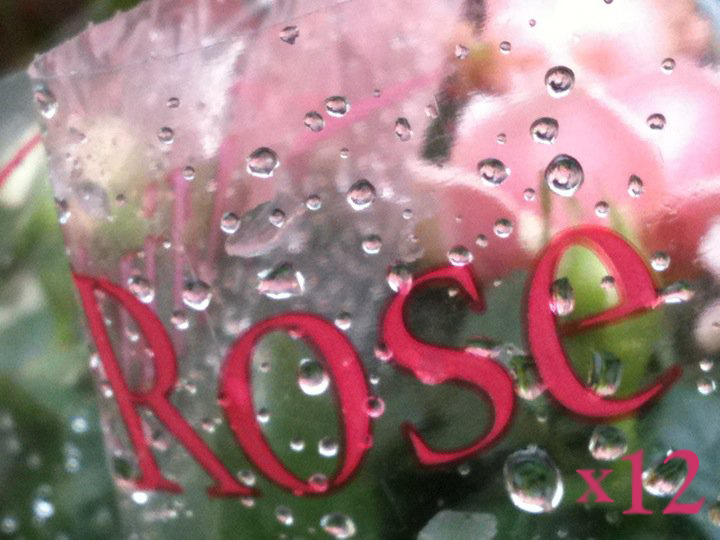 The “de Rose” part is what seals the deal for me: it's a soft, realistic rose that doesn't veer off into lemon, patchouli, berries or candy, like many cheap-o “rose” scents do. 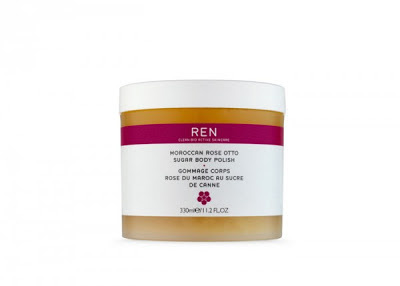 Ren Moroccan Rose Otto Sugar Body Polish from “clean skincare” line Ren is my all-time favorite body product. And calling it a "product" doesn't do it justice, because it's really a nirvana playground for your skin. It's a disarmingly simple paste of cane sugar, rose oil, olive and almond oils, plus kola nut and tea extracts to give your skin a buzz. But oh my giddy aunt -- once you scoop out a pawful and commence to scrub-a-dub-dubbing, your world turns into a symphony of sensuality. There are two irresistible sensations competing for your attention. 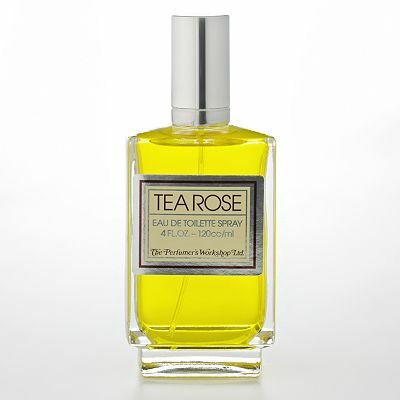 First, there's the smell: the rhapsody of a rose garden in full bloom: honeyed and green and rich and fresh. And then there's the savage, playing-with-your-food-feeling of rubbing this glorious paste all over yourself. It's a little naughty, like you're a cupcake and you don't know when to stop frosting yourself. And while you're tripping out in ecstasies of pleasure, Moroccan Rose Otto Sugar Body Polish is quietly going about its business. The grit of the sugar gently exfoliates your body into heretofore unexperienced smoothness, allowing the dense oil to permeate your skin, leaving it plumped and softly fragrant. Read more on Moroccan Rose Otto Sugar Body Polish on my beauty and lifestyle blog, Mixties. 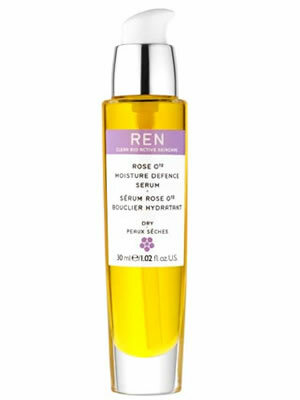 Ren may call this stuff a serum, but to me it's an oil, perfect for skin that seeks to reclaim its former rose-petal dewiness. The rose smell is great: not too shrill or perfumey, just right for a face product. The oil is...oily, but it's not too thick and sinks in well enough, especially after a little glow-inducing facial massage. 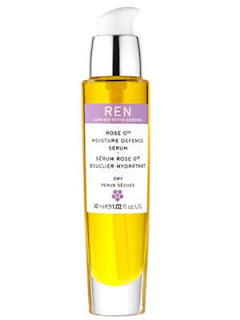 Check out the Ren website for their spiel on Bio Extracts this-that-and-the-other, but all I know is that putting it on at night (and sometimes on dry, desert air mornings) feels like an indulgent, pampering treat. Bonus: it's packaged in a pump bottle that eliminates messiness and waste. Having established my double major in perfume and lipstick, I can also reveal that I am pursuing a minor in hand cream. There are so many ways to go wrong with hand cream: the texture, the lubricity, and oh the smell, the smell, the very bad smell. 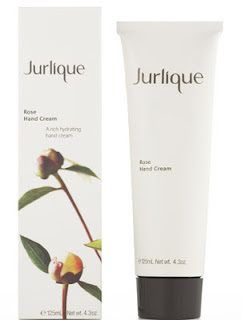 Rose Hand Cream by Australian brand Jurlique avoids all the pitfalls: it has a light feel but it's also moisturizing, it sinks in fast, and best of all: the smell, the smell, the very fine smell. This rose hews more to the “idealized caramelized flower” of something like Brûlure de Rose by Parfumerie Generale: a little sweet with wisp of musk. By now, you might be getting the picture that I'm big on lubricating my hide, and you'd be right. I've read all those Allure magazine articles where experts say we'd be just as moisturized with a can of Crisco, but I prefer to wait until the zombie apocalypse before I consider that alternative. 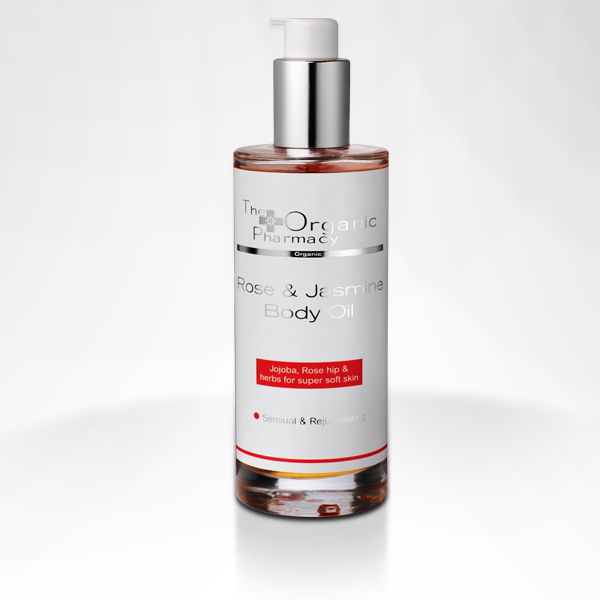 In the meantime, my hide lubrication preference is the Rose and Jasmine Body Oil from the Organic Pharmacy, a British line I discovered earlier this year. 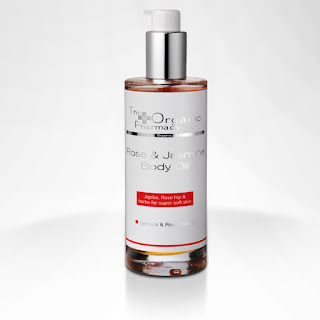 I immediately zeroed in on this particular body oil, which takes the savory plushness of rose and sexes it up with bed-tousled jasmine. Je dig. Weleda Wild Rose Creamy Body Wash from German natural skincare line Weleda comes in an appealingly hot-pink squeezy tube inscribed with the words “pampers, harmonises and nourishes”. I'm the suggestible type, so I'm already well on my way to total harmony with Oprah's best version of myself by the time the lightly musked rose scent fills the shower. The smell is pretty and soothing, and the body wash is indeed creamy. Miller Harris is not only the purveyor of strikingly lovely perfumes, but also of gorgeous teas, olive oils, wallpaper, and other life-enhancing treats. I'm still going strong on Thé Pétales, Lyn Harris's rose tea blended with vanilla Ceylon, Taiwanese white tip oolong and geranium bourbon. Drinking it is a joyously synesthetic experience. We now proceed to the perfume portion of the program. 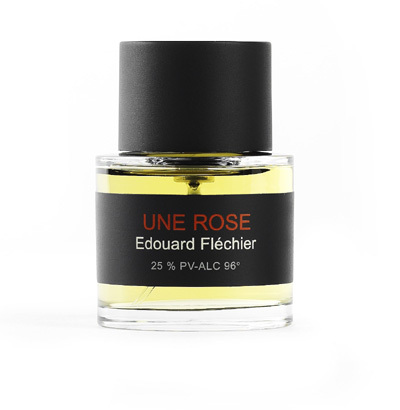 Wearing Une Rose is like living inside the most enormous, lascivious, carnivorous rose ever to bloom. This winey rose has roots deep in the earth, soaking up the nectar of salted honey, truffled dirt and spiced amber. This is a rose perfume with a lust for life. 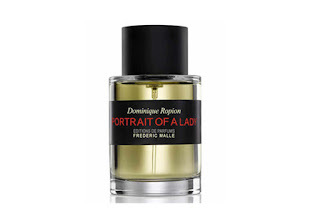 Portrait of a Lady is not so much a perfume as a byzantine presence that embellishes even the most mundane day with mystery and dark beauty. For all of its dusky patchouli-rosy-oudy-musky-minty-berry divinity, it's not bombastic. This is a big scent, but incredibly, not a loud one. The sillage caresses, rather than oppresses. A proper adult perfume, Portrait of a Lady is a swirl of sensation compressed into a halo that generously gives you all the credit for its worldly complexity. 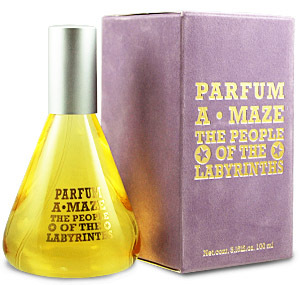 A*Maze parfum is always in my high rotation of perfume picks. The smell is a thick molasses of rose, saffron, orange blossom, henna and oud. I'm mesmerized by its conflicting sensory triggers: the jammy rose starts to make my mouth water, and then the lemon floor wax oud dries up the drool. And then the drool-to-dry cycle repeats. I'm a regular Möbius strip of saliva. Along with A*Maze's odd, herbal side, there's also a honey cast: an animalic floral niff that marries the saffron/rose/floor wax to the skin in a salty, sensual way. 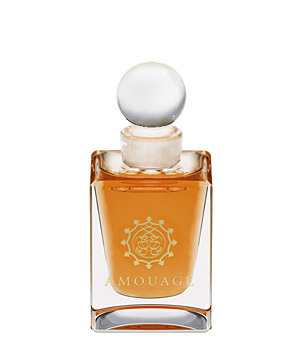 I've smelled many of the attars from Amouage, and Ayoon Al Maha (translated as “fawn's eyes”) is my favorite. Yes, I still think Homage Attar is glorious, but Ayoon Al Maha is the one I reach for when I want to feel special, or comforted, or as me as I can be. The classic rose-frankincense-sandalwood-oud attar blend is brightened with orange blossom and sings with sunshine. It's the Queen of Sheba skipping out from her dark palace to take the air in her miles of gardens. Nothing beats the satisfaction delivered by Tea Rose. It's the life cycle of a rose on your skin: dewy fresh, then fruity wine, then the soft memory of a lover’s dozen. A shimmering rose hologram, and all for ten bucks! Thanks to Ayala Moriel for rounding up us rose-luvvas! Thank you so much for being part of the Dozen Roses blogfest! The body products you picked look AMAZING. I loved Dr. Haushka's chap-stick that was also rose scented and quite emollient, and Samara Botane has one too which is quite fantastic. The truffle note in Une Rose is fantastic! Portrait of A Lady was too big for me though. But from all your dozen roses, I think I'm already sold on the REN sugar scrub. Your description is so vivid! After reading everyone's list, I now have a list of my own with new cosmetic suggestions to try. I love trying new body/face products and your list is perfect for that. This has been my absolute favorite communal blogger project to work on because of everyone's fab rosy picks I've yet to try! Katie, you are a snake charmer with words, my goodness, how you seduce! Thank you for these delicious scent portraits you have painted. This is so much fun! I haven't gotten through every communal blog post yet, but I am really enjoying it so far. This is my very favorite communal blog project ever! I have so many new rose roads to follow from everyone's picks. Katie, you've made me crave rose products like no other. I feel like going and slathering myself with thick rosy balms from top to toe (disturbing mental image, I know). I completely forgot about tea, but I do have a canister of Harney&Sons rose petal tea, so I think that'll be my afternoon treat. That's saying something, Gaia, because you're not naturally inclined to rose-loving, are you? Let us clink our china cups of rose tea together in a toast! Caron's finely-milled loose face powders are beautifully rose-scented. Really? Wow! [hustles off to Google this..returns enlightened] This is verrrrrry interesting...but hard to find. Only NYC and Paris have Caron boutiques - do you know where else it's carried? Katie, you have me hanging my head in shame that I have not yet tried any Ren products! Now after reading your seductive reviews, especially of the Rose Body Polish, I must get my hands on some STAT! I love that we both put the Weleda Body Wash on our lists, it's a pretty little workhorse isn't it? The Calendula one is terrific as well, even though it's marketed for babies, there's no stopping this grown up from using it! Oh my lady, you have a treat in store for you with the Ren Rose Body Polish! It's incredible. I have the Tea Rose, bought online from the US - I am in the UK. I also love some of the Rosine fragrances - Rose d'Ete is one I finished a while ago. I love the Weleda products and the Moroccan Rose Otto bath oil, but it is beyond the reach of my pocketbook at the moment. When I was very flush a few years ago I did buy the Terry Baume de Rose and loved it. Catherine, it's annoying how pricey some of this stuff is. I like the Ren Rose bath oil okay, but I think a better deal is the scrub, because you get the 2 in 1 combo of the rose oil and the exfoliating sugar (which is much gentler than a salt scrub and just melts away on your body). Thanks, Katie, I have just ordered it from the LookFantastic website where it is on sale for £25.60, and have also ordered the body wash which is also on sale for under fourteen English pounds. Up to now, have only tried the bath oil. I also have some of their lavender bath oil, which I don't think they make any more. Oh and meant to ask, have you tried the Jo Malone Rose fragrance? I sampled it months ago. I *really* like JM's Red Roses! It's my favorite from that line. The special appeal for me is the way it starts to smell really thick and honeyed the longer it's on the skin. Another rose perfume that does the honey thing is Annick Goutal Ce Soir Ou Jamais. Katie,have you tried Rose Anonyme by Atelier Cologne? I'd be interested to know your thoughts on that one. I loved the sample I got but my full bottle smells a little off. I'm not quiiiite convinced by Rose Anonyme yet...I've tried it a few times and can't click into what the whoop is with it. So far, it just smells fresh and lovely and light...but then again, I smelled it during a day at Scent Bar going on all the rides and spraying all manner of perfumes on myself. So I do need to give it some dedicated face time to understand its personality. Great tips, both about Vintage Rose and your Rose post. I'm going over to your fantastic blog to read it right this instant! Elisa, I've just popped your The French Exit roses post in the bloggers rose-fest list, above. It's a must-read for the rose-bedazzled. Thanks for crashing the party! with these posts you both solidify your standing as my rose gurus! and katie, i believe this gushy second mention of the ren body polish has finally worn away my resolve. how can i resist!? i *am* "a cupcake who doesn't know when to quit frosting herself." Him indoors said "What IS that SMELL?". I told him,and he said..."Sweaty sandals and rosewood more like...."
I blame you, Ms Puckrik. I wonder if Ayoon al Maha is still gettable? When I bought it from the Amouage boutique in London a couple of years ago, the lady brought it out from a hidden drawer where they had secreted all of the attars except for Homage and Tribute. They were all about to be returned to HQ, for reformulation or discontinuation, she didn't know (or wouldn't say). I hope it's still in the line, because I'm plowing through my bottle and will require more! Justineantonia - I adore girly swots! Your update on the continued availabilty of Ayoon al Maha has put a little baby fawn kick in my gallop. Thanks! I liked being reminded of the word "conniption". Thanks for that, and the tip about the Taif Rose attar. I am verrrry intrigued with that Rossy de Palma scent. I love it every time I try my sample. Love the notion of Portrait of a Lady as a "byzantine presence"! You had me scurrying to my own (grossly underused) pot of Ren body scrub, but it is not the rose one so sensually described in your post, but rather Guerande Salt Exfoliating Body Balm. It doesn't half hurt in fact, like rubbing salt into wounds that spontaneously arise as you scrub. I am a big fan of that particular MH tea. 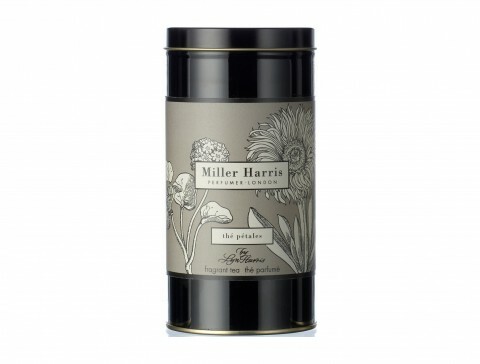 I ran out some time ago, mind, and use the tin for tea bags of a much more homely provenance. Hah! Creating and healing the wounds in one gritty handful. Thank you for sharing the roses far and wide Katie. This list inspired me to create my own: 13 roses for both men and women who might be feeling unloved! I hope you and others have the chance to take a peek. Thanks PD, your flair and cultured swagger are a zesty addition to the fumisphere. Everyone - please adjust your cravats and fascinators and stroll over to the Perfumed Dandy's blog to take the air. You'll be tickled. I was a big fan of Malle's POAL and invested in a 50ml bottle to then fall in love with Rose d'Arabie from the Armani Prive arabian nights inspired collection. Quite close to POAL but with more saffron...totally decadent and luxiorious but with a retail price even scarier than the Malle's (and they don't do bottles smaller than 100mls). Also from Armani Prive I love Rose Alexandrie, a lighter eau for spring and summer...beautiful! A perfect dozen. I love everything on your list. POAL is still yelling at me for excluding her from my list. Hell has no fury like that of a POAL. 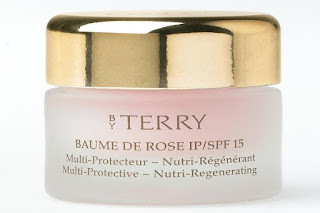 By Terry Baume De Rose sounds lovely, but what's a poor college student to do? We aren't able to drop $50+ on a lip balm. Any suggestions for something affordable, yet luxurious for winter weathered lips? I've pondered on your question, Kristin-Hope, and I don't have a good answer...maybe a passer-by here can chime in? There are plenty of pink-Vaseline-in-a-tin rose salves that are good and cheap (e.g. Smith's Rosebud Salve, Rose & Co Rose Petal Lip Balm, C. O. Bigelow Rose Salve), but they just don't have the luxurious buttery sink-in-ability (and the great smell) of Baume de Rose. Dior's Creme de Rose is *very* similar to the By Terry product, and it's half the price, but you also get a lot less for your money. But it's a way to go if you don't want to dwell on the horror of paying $50 for a flippin' lip balm. I suspect that a Baume de Rose-esque lip balm may well be produced by an indie natural cosmetics co. In the meantime, I'm going to continue to keep an eye out for something like this. K-H, maybe try Jurlique's Rose Love Balm...? Good smell and some nice ingredients (i.e. no petroleum = real moisture). Waxier than By Terry, but gets you there in the end less expensively. Hi Katie! I watch your Youtube channel decently often, and you certainly have a way with describing perfumes. I've been on a kind of rose kick lately, which is very opportune for the release of Balenciaga's Florabotanica. I've tried it and absolutely love it, and was curious about your take on this almost mainstream scent. Some reviewers have said the perfume has a very heavy cannabis note, though I don't get that. Being the guru that you are, what would you say are the most prominent notes in Florabotanica?